This little figgy went to the market…. this little figgy ended up in gelato! 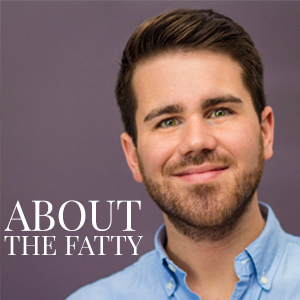 You’ve probably noticed that I have a new found love for all things fig. I recently posted a recipe for Fig Mille-Feuille, and now I’m mixing it up in some homemade gelato. Yes. It is fall/pre-winter. Yes. I am still eating ice cream because it’s my party and I’ll eat ice cream if I want to. I’m a strong believer that cold desserts aren’t just for summer. Did I mention bourbon yet? Y’all know that I can’t go very long without including a bit of southern gold into my recipes. 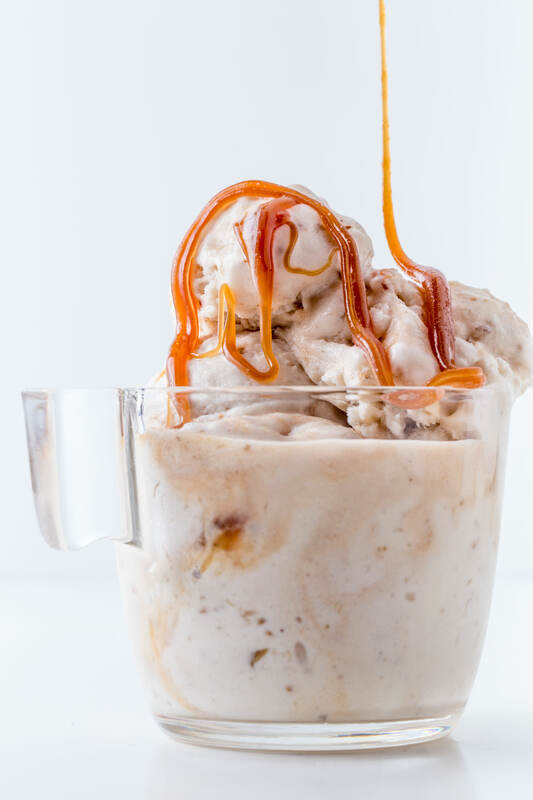 We’re swirling a bit o’ bourbon caramel into the mix. I’m pretty sure it will take care of keeping you warm all winter long. What really got me on this gelato kick idea was tasting some truly unique flavors at a preview event for a restaurant that is opening this fall. Pastaria is killer pizza joint in St. Louis that has decided to expand a little further into the south here in Nashville. 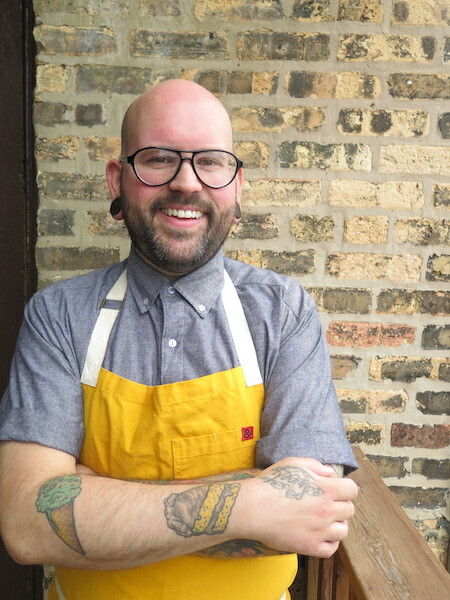 Along with badass pizzas, they have their own pastry chef, Mathew Rice. Luckily for us, Mathew is coming to town with the restaurant. Luckily for me, he’s a friend of mine and let me taste some of the flavors of homemade gelato that they created. My favorite? Burnt toast and jam gelato. SERIOUSLY. I was absolutely amazed at how Mathew was able to capture that epically familiar taste in a perfectly smooth cool treat. Do I normally eat burnt toast? No… Although, I do inadvertently make it quite often. I burn everything at least once. When combined with the sweet cream base of gelato, the slight bitterness of the burnt toast and the sweet jam was an absolutely killer combo. I took a couple extra cups of gelato home and started to think about how I could incorporate some flavors into a recipe. I’ve made ice cream quite a bit, but haven’t spent much time with gelato. I’ve eaten my fair share, but usually leave it up to the pros to make. Turns out, it isn’t so hard after all. Full disclosure… I totally convinced Mathew to share his homemade gelato base recipe with me to use. (Thanks!) — Definitely check out some of his beautiful creations on his Instagram here. Since I was a bit overly-excited about fig season this year, I had quite a few left in the kitchen. It only made sense to try and use those. 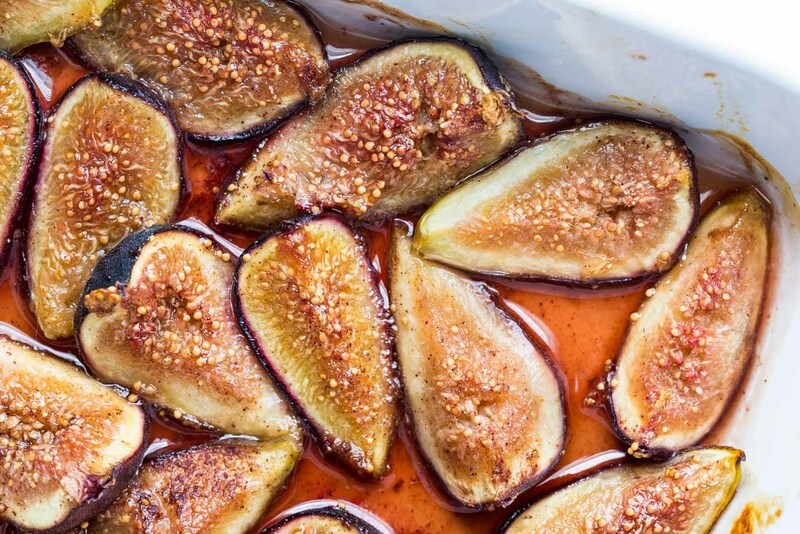 What would go well with figs for flavor balance? Ummmm… BOURBON. Bourbon goes well with everything. If I only knew how well this caramel sauce would taste, I would have made it by the gallon instead of the smaller test batch that I started with. It’s incredibly simple to make, and will last forever. Assuming you don’t just eat it all with a spoon like I may have done. Turns out that the sweetness of the figs with the slight kick of the Kentucky thunder is absolutely a winning combo. 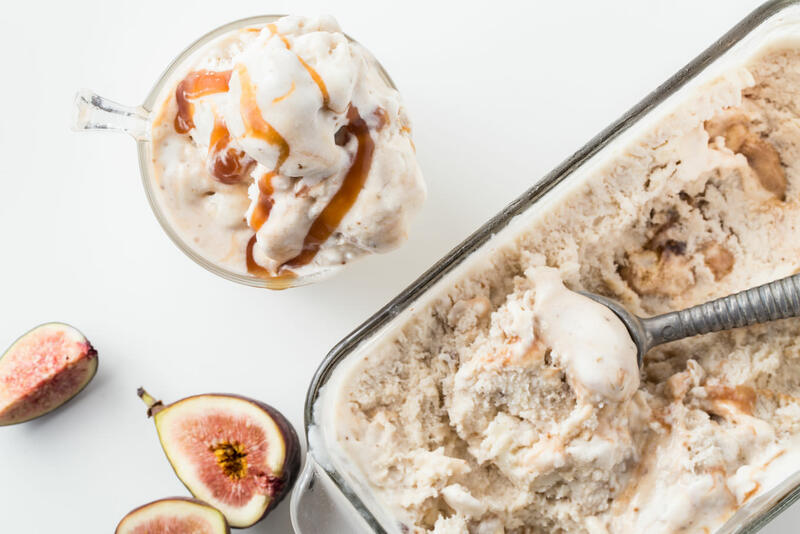 Since making this, I’ve had many days that start by wondering if I should call in sick and just sit on the couch in front of the fire place, pop in a little Hocus Pocus, and go to town on a pint of this gelato. Since I want to keep my health insurance and benefits in check, I won’t admit that I’ve ever done that…. but I would strongly encourage it. If I knew anything about it, I mean. Don’t be surprised if you see a ton of gelato recipes rolling out in the near future. This cool treats for winter phase isn’t going anywhere soon, I don’t think. I have lots of other boozy ideas brewing. Certainly enough to keep me occupied while I hibernate through until next year. Move over, winter. This season is going to be all about desserts. 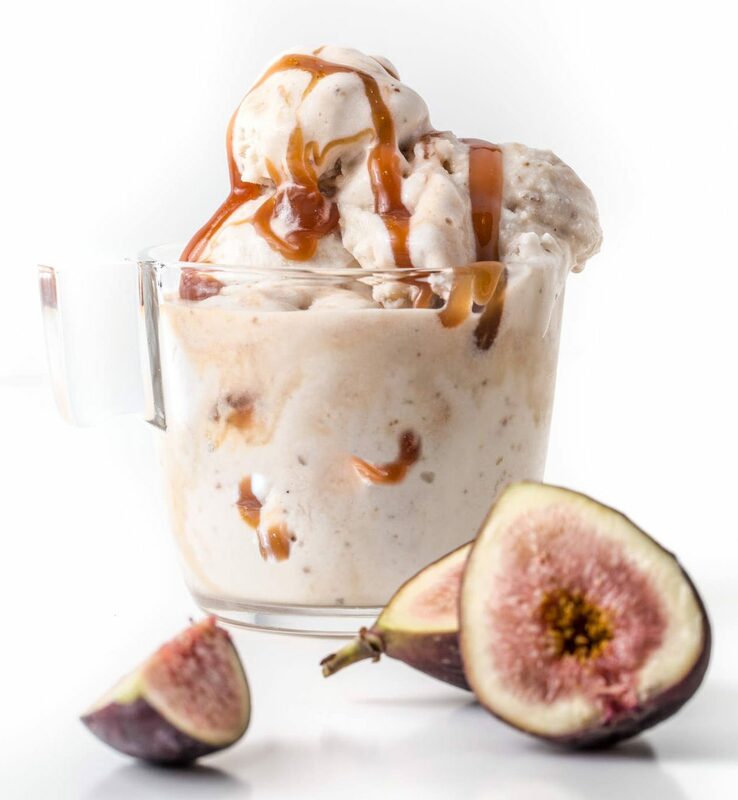 Creamy, smooth gelato with a fig infusion and swirls of homemade bourbon caramel. By SouthernFATTY.com. 1.5 oz (or 3 tablespoons / 40g) cream cheese, room temp. Combine brown sugar, cream, corn syrup, butter and salt. Cook over medium heat in saucepan, about 8 minutes. Stir frequently. Add bourbon and stir until thickened and smooth. 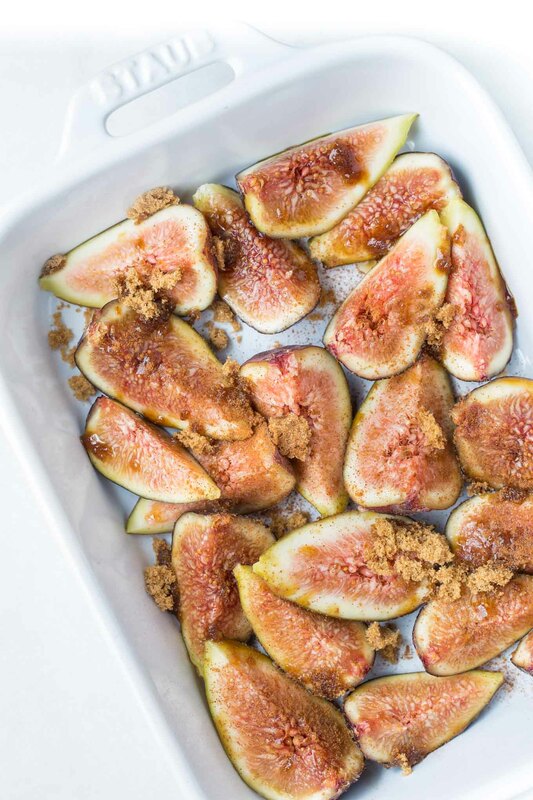 Combine figs, honey, and brown sugar in baking dish. Roast until caramelized and fragrant, about 10-15 minutes. Remove and cool. Keep the honey liquid. Combine milk, cream, honey liquid from roasting the figs, half the sugar. Set aside. In a bowl, mix together other half of sugar, milk powder, cornstarch. Add ½ cup or so of the milk solution you first made to the dry mix and stir to combine completely. Add remaining milk mix to a saucepan over medium-lo heat. When steaming, slowly add the cornstarch slurry and whisk to combine. Bring to a gentle boil and cook for 1 minute, stirring continuously. Remove from heat and mix in cream cheese, pinch of salt, and the roasted figs. For best results, use an immersion blender to fully blend. Cool and transfer to a container to chill completely. Setup ice cream machine with chilled bowl, etc. as instructed. Transfer mixture and freeze completely per machine instructions. 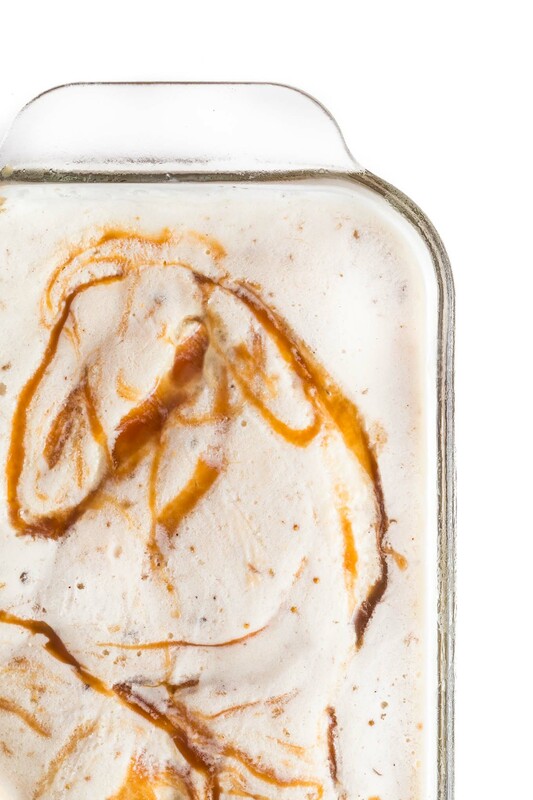 When frozen and smooth, transfer gelato to freezing container and swirl in bourbon caramel. Adapted from Burnt Toast Gelato recipe by Mathew Rice. Are you a purist or do you like mix-ins? This looks crazy delicious! Almost makes me want to break out my ice cream maker from its winter home! Dooooooo it! That bourbon will keep it warm.